##A free tool attached with AOMEI Backupper Boot multiple client computers within same LAN through the network booting from an image file on a server computer for system maintenance and optimization. ###Overview of AOMEI PXE Boot Tool The main function of AOMEI PXE Boot Tool is to boot your computers from an image file on network. It’s easy to use it. After installation, you just need a few clicks following the guide. Besides, it supports synchronous boot of multiple computers. 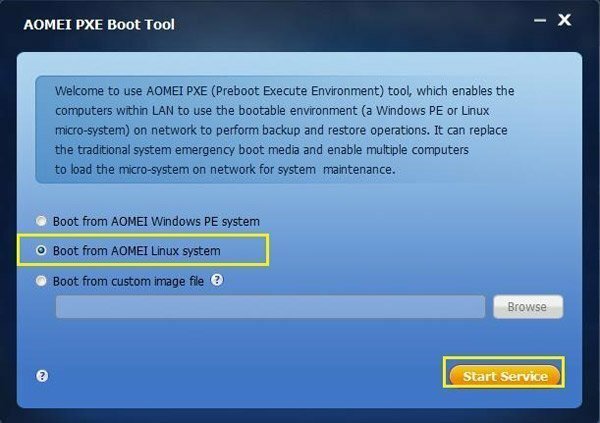 ###When to Use AOMEI PXE Boot Tool? * You need to maintain or install system for multiple computers and it’s impossible to insert CD or USB into these computers one by one. Your computer cannot start normally already and it can’t boot through loading image file on inner hard drive. You have a server and a lot of clients within LAN, but these clients may have no CD-ROM drive and USB ports. Or the CD-ROM drive and USB ports are unavailable.